As supplied by St David's Water & Gas Company. Mains Piped Water, from Nine Wells arrived in St David's in 1901/2 supplied by The St David's Water & Gas Company, which had been formed around 1898/9. The Directors of the company were William Bentham Martin, Charles Hibbert Binney and Arthur Henry Brown. Prior to the arrival of piped water supply, St David's like so many other settlements relied on wells to provide water. The Ordnance Survey map of 1889 shows the location of a good number of wells in St David's, some with pumps. Not all wells are recorded as those within a property were often omitted. All wells relied on the ground water being replenished and in St David's the upper strata into which most of the wells were sunk is water bearing material (poor), which allows the seepage of ground water (rainfall) into the well. In mid-victorian times, it was a requirement under a Public Health Act of Parliament 1875, that public wells or pumps should be provided by the local authority or some other local body and sometimes this requirement was carried out by the church or the parish council. At St David's and before the arrival of piped water, it is known that there were four major public wells, located at the High St. 28, Waun Gwla, Quickwell and Lower Moor. In the autumn of 1899 the St David's parish council was seeking to deepen the High Street well so as to increase the water supply for the public. 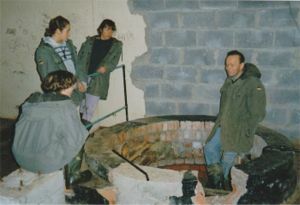 The location of this well was adjacent to the east gable of the premises known as The City Stores in the High Street which was served by a pump. From mid 19th century it was a requirement of Parliament that when a local authority or private company proposed to supply water to an area, legislation required that they obtain an Act of Parliament (known as a Water Act). In 1898/9 The St David's Water & Gas Company instructed a consulting civil engineer, Togarmah Rees of Newport, Monmouthshire, to design and prepare drawings and supporting documents for a water supply scheme for St David's, details of which were included in the company's application to Parliament for a Water Act, as summarised under Section 21 of the Act. The Act received Royal Assent on 10th June 1899. (note: The Act also allowed for the provision of water to Solva). The consultants selected a source of suitable water at Nine Wells, map ref. 178776 224812 located about two miles from St David's on the road to Solva. The choice of Nine Wells was no doubt due to the large number of springs shown on the 1889 O.S. map. The analysis of the water, as given on a sample taken later in 1931, indicates that the sample taken was clear, bright and free from more than a trace of suspended matter and that the water formed a satisfactory supply for drinking and domestic purposes. Briefly the scheme consisted at Nine Wells, of an underground 6 foot diameter, 12ft. or so deep collecting chamber over which was built the Nine Wells Pumping Station, (now converted into a dwelling house). Water was pumped from Nine Wells to an above ground service reservoir, capacity about 50,000 gallons located on the high ground on the south side of the St David's to Solva road near Llandruidion, and a supply pipeline to St David's about 2 miles distant. Construction work commenced in January 1900. Water supply from Nine Wells was available in the City from 1901/2 and over time houses requesting water supply were connected up, as supplied by the St David's Water & Gas Company. Well water remained available for some time to come. The 'collecting chamber' in the pumping station. Note the outflow pipe was to the left. The water company continued to operate, but by 1915 it had run into financial difficulties and the undertaking was eventually disposed of by the Receiver in October 1915. The directors of the new company were local business men, David Evans, J. W. Evans, E. R. Evans and Henry Evans as company secretary. In the 1930's due to an increase in the demand for water brought on by the flushing inside toilet, an additional underground collecting chamber was built just across the road from the Nine Wells pumping station and connected at low level to the chamber in the pumping station. Also in the 1930's the service reservoir at Llandruidion was increased in size by raising the wall height by about 6ft. The fenced in underground reservoir. the coal lorry reverse to tip the coal into the pumping station. According to a 'Water Survey for Great Britain' report submitted in 1935 by the St David's Water & Gas Company to the Ministry of Health, the yield of the source at Nine Wells was around 7,000 gallons per hour and the pumping per day was for 4 to 7 hours. The maximum daily yield available was up to 50,000 gallons which was more than enough to supply St David's during the 1930'3 and 1940's. The St David's Water & Gas Company continued to supply St David's with water and later directors included Henry Albert Nash, his son David Nash became Company secretary. In 1945/50 the Company was taken over by the Haverfordwest Rural District Council and later became part of the Pembrokeshire Water Board, where water was also supplied from a source in the Preseli Hills. In 1974 Welsh Water took over most of the water authorities in Wales. (Note: the gas side of the company was nationalised in 1948). 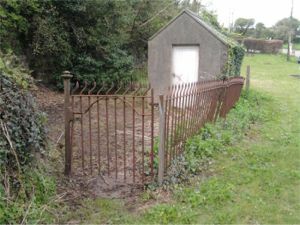 The disused pumping station was sold in 1979 by the Pembrokeshire Water Board to the present owners who converted the building into a dwelling house in 1990. Due to this conversion, the outflow pipe now runs from the reservoir underground and comes out just below the car park near the National Trust plaque. Researched and written by Howard Jones, F.I.C.E. May 2012.